While I rely on iCal to help me track meetings and to dos, I’ve always found the actual process of adding new events and to dos much more complex than it need be. Typically I’ll be in some other application when I realize I need to create a new to do or event, so that entails launching iCal, finding the date on which I want to add the event, double-clicking to create the new event, then (thanks, 10.5) pressing Command-E to bring up the edit box. Creating a to do is somewhat easier, but only because iCal won’t let you pick a due date for your to do until after it’s been created. Thankfully, there’s a solution at hand—one that will let you create new events and to dos (to dos can only be created in 10.5), regardless of which program you may be running at the time. As a side bonus, you can even specify most of the fields at the same time, leaving only minor clean-up work to be done in iCal itself. Although you will have to use Automator, the two workflows you’re going to build are about as simple as they get. We’re going to build two different (10.4 users can only use the first one) one-step workflows, one to handle new events, and the other for new to dos. We’ll then save these workflows as applications that can be called from anywhere via the Dock or your favorite keyboard-based launcher utility. Start by launching Automator, in the Applications folder. Depending on whether you’re running 10.5 or 10.4, the instructions will vary slightly. If you’re running 10.5, you’ll first see a “choose your starting point” screen. Click once on Custom, the click Choose. In 10.4, Automator will simply open. Under both OS versions, you’ll now be looking at the Automator interface, with a list of items on the left and a blank work area on the right. Once you have the dialog set up as you’d like it to appear, select File -> Save. 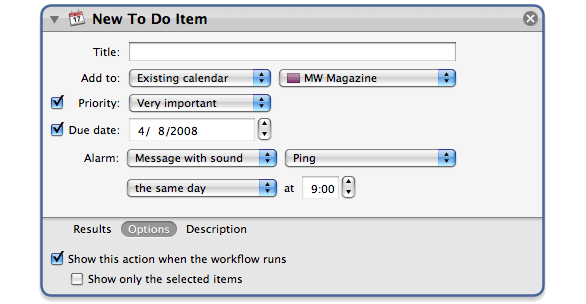 When the Save sheet appears, name your workflow (Create iCal Event, perhaps), and choose a save location such as your user’s Documents folder. Before clicking Save, however, click on the pop-up menu next to File Format, and select Application as the file format. Congratulations, you’ve just created an application. To test it, quit Automator, find the application in the folder where you stored it, and double-click. (If you’re running 10.5, you’ll see a warning that this is the first time you’ve run this application; click Open.) After a brief delay, you’ll see an iCal event dialog on your screen; fill it in then click Continue. Your little mini-application will then silently add this new even to iCal—if iCal’s not running, it will launch, but regardless of its launch state, it won’t come to the foreground. I find this a much nicer way to add events to iCal, especially in 10.5, as it means I don’t usually have to muck with the ungainly floating box interface at all. There are a couple exceptions, of course. You can’t set multiple alarms (in 10.5), nor can you add notes or URLs to an event, without going into iCal itself. But for simple events, this solution works great. Just as with the first workflow, select File -> Save, name the application and choose a save location, and set the File Format pop-up to Application. Quit Automator and test your new to do creator—I actually like this one even more than the event creator, as this makes it a one-step process to create to dos. To make your applications accessible from anywhere, just move them into the Dock. You could also store them in the Finder’s sidebar or toolbar. If you use a program launcher such as Butler, LaunchBar, or Quicksilver, or a keyboard macro tool such as Keyboard Maestro, you can even launch your programs via the keyboard. In my case, I used Butler to assign keyboard shortcuts to both, and I can now create events (Command-Control-E) or to dos (Command-Control-T) from any program at any time.